This large garden room by INSITU Garden Offices incorporates a good sized storage room and a toilet with 200-litre pumping station. Sited across the width of the garden this garden room maintains access to the rear gate thanks to doors on two sides. The room also has a secret store and artificial green roof. 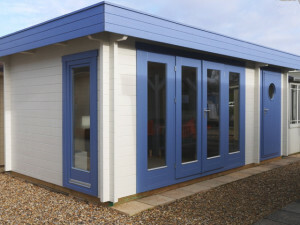 One of the best ways of maximising the space in your garden is to combine a garden room building and your storage shed. Suppliers like Contemporary Garden Rooms can design you one well designed building. 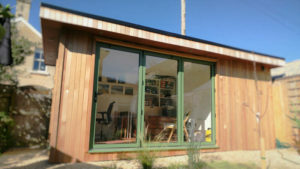 We have recently been introduced to the work of Miniature Manors who offer a bespoke garden room design service. Garden Spaces have recently completed this contemporary design which has free flowing indoor / outdoor space. Is one room enough for your needs? Well garden room design lends itself to multi room layouts, whether that be for a garden office with separate store or a large self contained garden apartment. Buyers fear that a large garden room will dominate a small garden, but with clever positioning and design this needn’t be the case, as this recent build by Garden Fortress shows. 3rd Space the architect designed range of modular garden rooms have recently completed this stunning build in North London.